By making your own smelly jelly in jars that would have gone in recycling, or canning jars and then covering them with fabric canning jar covers, you can keep an air freshener for a long time, use up fabric scraps and not put more plastic in the landfill! One of my smelly jellies made with water crystals is almost five years old now and by adding water it still offers a great scent. 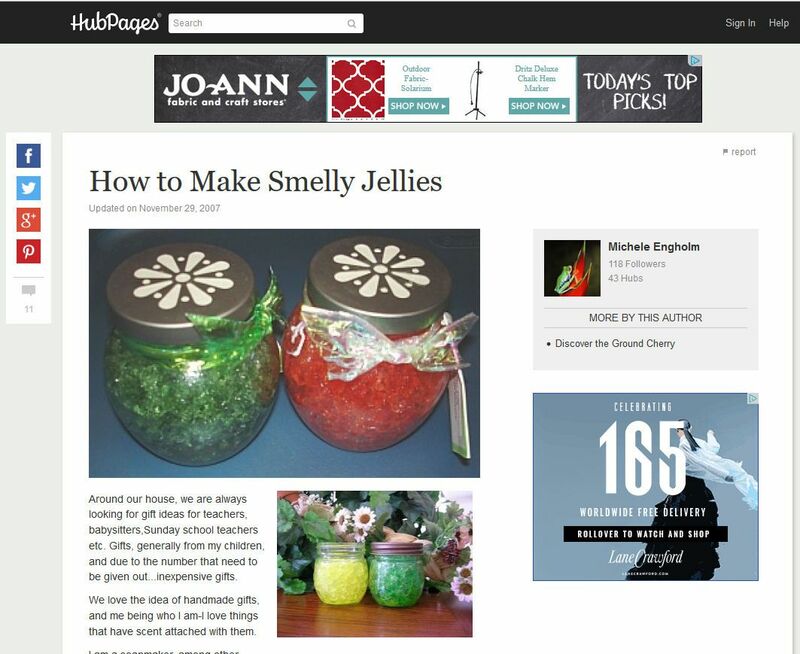 Unlike candles, Smelly Jelly is not designed to be burned like candles even if a candle supply company offers a recipe! A small and a large batch recipe are included on this site, as well as a personal take on the recipes and how to use them. Read the entire page so you don't miss any tips or pointers. This recipe uses soap making supplies but seems like a simple direct method to make smelly jelly using water crystals. Water crystals offer another simple recipe for making your own smelly jelly using water crystals. Two other recipes are offered on the same page, one for a dog bed and one for cool-down ties. This recipe uses unflavored gelatin to make a gel air freshener. The tips that are offered will create a layered smelly jelly and are worth taking the time to read through. This detailed set of instructions is much like the others but each recipe offers a bit more information and tips. You'll stop buying air fresheners when you see this recipe and how it's made with easy to obtain supplies. Fabric canning jar covers will dress these up very nicely. This site offers a great recipe and links to all of the supplies that are sold on their site. Their information about why you should use distilled water is enlightening. This is a simple recipe with links to the supplies that Lone Star Candle Supply offers for sale but still uses many items that you may have in your kitchen cabinets. This super simple recipe used gelatin rather than water crystals and suggests covering the finished product so fabric jar covers are a perfect compliment. This site's focus is selling their crystals which appear bigger than those bought in garden centers so they would make a pretty smelly jelly. The recipe is a super simple condensed recipe that is easy to follow.